The first Nasimi Festival of Poetry, Arts and Spirituality, dedicated to great Azerbaijani poet and thinker Imadeddin Nasimi (1369-1417) is being held in Azerbaijan from 27th to 30th September 2018, AzerTag reports. The poems of this great poet are remarkable not only for their brilliant masterfulness, but also for a deep sense and convincing sincerity that takes the reader into thoughts about the mystery of being and touches the deepest layers of soul. The program of this large-scale event includes various types of art, music and knowledge activities. As part of this programme, two internationally renowned musicians of Azerbaijani origin, Alim Gasimov and Sami Yusuf, one from the north and the other one from the south of the Araz river that currently divides the major Azerbaijan into the northern part, the Republic of Azerbaijan, and the East Azerbaijan province of Iran, are also participating in this festival. While Alim Gasimov joins the event from Baku, Sami has come from London. Alim Gasimov, a “living national treasure” of Azerbaijan, has played a great role in spreading Azerbaijan’s musical heritage, the mugham, in the world. Mugham being an ancient musical tradition and a cultural phenomenon is a highly complex art form that weds classical poetry and musical improvisation. Alim’s unique performing style combines deep knowledge of centuries-old rules of mugham with challenging innovations. The world‘s appreciation of Azerbaijan’s musical riches was poised to change due to Alim Gasimov’s performance. As the New York Times cites, “Alim Gasimov is one of the greatest singers alive, with a searing spontaneity that conjures passion and devotion, contemplation and incantation”. Le Monde describes him as a virtuoso possessing ‘one of the most beautiful voices of our era’. The Guardian claimed him to be “one of the most thrilling, unashamedly emotional performers on the planet”. In recognition of Alim Gasimov’s musical contributions to world peace, he was awarded the coveted International IMC-UNESCO Music Prize. With this prestigious award - the ‘Nobel Prize for Music’, Alim Gasimov joined a select company of musical genius, such as Yehudi Menuhin, Dmitri Shostakovich, Leonard Bernstein, Ravi Shankar, Olivier Messiaen and Daniel Barenboim. Sami Yusuf is a British musician who composes music and leads the growth of a new global music genre that engages millions of listeners. His grandparents were originally from Baku, but the family migrated to Tabriz and Sami was born in Tehran. When he was three years old, Sami’s family moved to the UK. He grew up in London and learned to play several instruments in his youth, acquiring his musical education from the prestigious London RADA School. With over 34 million albums sold to date, the influence of the music of Sami Yusuf cannot be understated. BBC newsnight acknowledges Sami Yusuf as “a mega star.” The positive message of his lyrics gives voice to a collective yearning for peace and harmony, and his use of global rhythms and melodies united by spiritual vision captivates listeners worldwide. His music features an inspiring collection of one thousand years of traditions from Azerbaijan, Andalusia, Arabia, North Africa, Central Asia and China. Along with Alim Gasimov, Sami Yusuf is the most world-famous Azerbaijani-origin musician alive today. 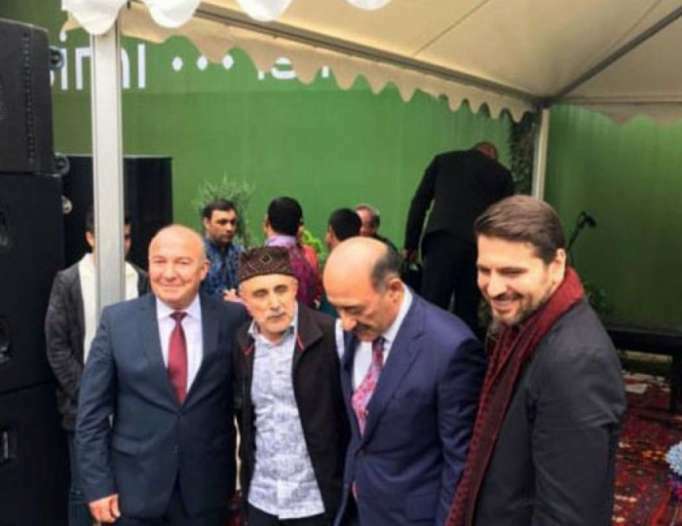 After joining the opening ceremony in Shamakhi and despite the busy schedule of the Nasimi festival, Sami returned to Baku to discuss collaboration opportunities. His songs are very inspirational and engage millions of fans. I am blessed to have had the opportunity to host Sami Yusuf in the house of Parichehr Deghati, the sister of world famous Azerbaijani photographer Reza from National Geographic, who lives in a historical building adjoining the 15th century UNESCO-recognized Palace of Shirvanshahs with the mausoleum of Seyyid Yahya Bakuvi, a distinguished Azerbaijani philosopher of the Middle Ages. The roof of this historical building commands a spectacular view of the capital city. Sitting in Peri’s house just next door to the Palace of Shirvanshahs, Sami Yusuf talks about collaboration opportunities with the homeland of his grandparents in order to make a journey inspired by the traditions stretching from East to West, with an emphasis on the rich legacy of Azerbaijan’s musical and artistic heritage. Future plans include a special mugham segment with the participation of Alim Gasimov and a traditional dance performance to Sami Yusuf’s solo concerts in Baku.